Looking to choose an opal for you or a loved one, but not sure where to start? To purchase the perfect opal for you, you need to know what you are looking for. According to opal miners, John and Leanne, finding Australia’s National Gemstone is a combination of knowledge, hard work and a lot of luck. 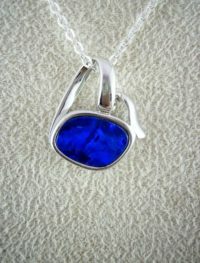 But, when you’re choosing an opal for yourself or a loved one, hard work is not needed and luck won’t cut it. You have to know what you’re looking at, and why two similar looking pieces have quite different values. There are two basic varieties of opal mined in Australia – Seam and Boulder Opal. The difference is that Seam Opal is found unattached or free in the ground. Boulder Opal is attached to or within a host ironstone rock. Seam and Boulder opal both produce three major sub-types. Which refers to the opaque body colour of the stone which will be grey, dark blue or black with spectrum colours coming from the dark background. Which is translucent to semi-transparent, without a grey or milky background, showing brilliant colours from a glossy background. Which has a light to milky background colour. 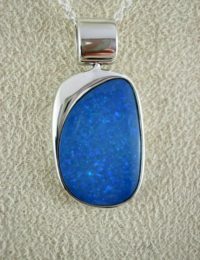 The spectrum colours coming from light opal are usually more subdued. The amount and brilliance of colour are of paramount importance. Milkiness, cloudiness or greyness sheds value. Rarity and popularity have determined that certain colours attract more value; from crimson to red, orange to green and then blue. The greater the number of colours the more prized the gem. This information applies to natural or solid opal. Triplets on the other hand are a thin slice of opal with a backing and a quartz or glass top. Doublets are a thicker opal with a backing. Triplets and doublets are not as valuable as solid gems. It is important to know what you are looking at. 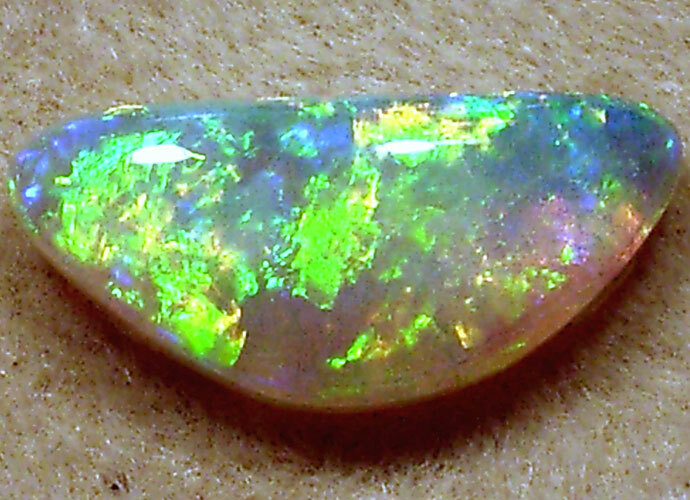 Synthetic opal is being sold – insist on authenticity in writing. 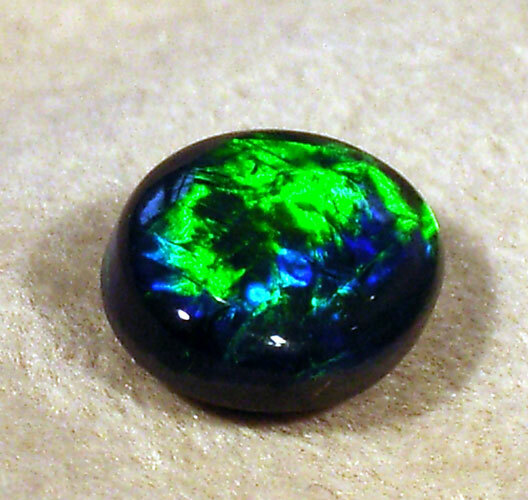 Be aware also that translucent opal can be darkened by either painting the back of the opal black or by oxidizing the jewelry. 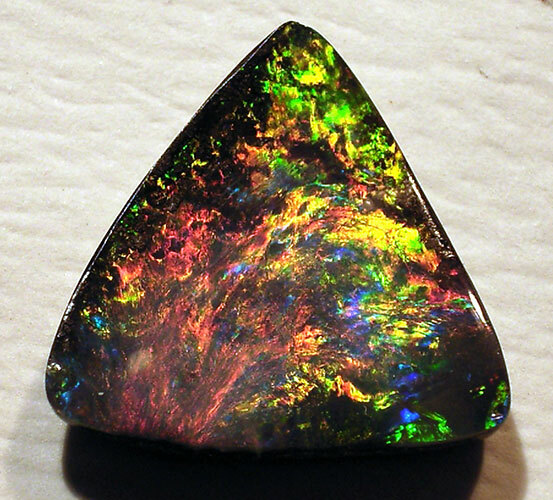 This brightens the colour and can deceive you into believing the opal is more valuable than it really is. 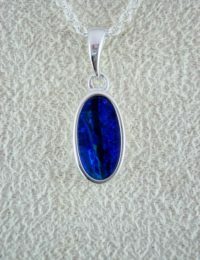 Inlaid opal jewelry is a real concern as the opal is very thin and easily broken. It is virtually impossible to repair or resize.